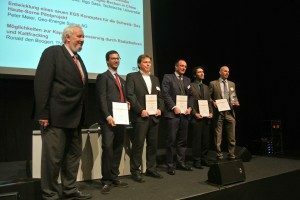 Exergy was announced today as the winner of the European Geothermal Innovation Award 2016 during the opening session of GeoTHERM exhibition and Congress in Offenbourg, Germany. The award was given for the 2-pressure-level cycle on a single-disk turbine demonstrated in Denizli Tosunlar geothermal plant, Turkey. The 2016 jury was composed of Dr Adele Manzella, CNR, Pisa, Italy; Prof. Halime Paksoy, CU, Adana, Turkey; Prof. Ladsi Rybach, Zurich, Switzerland; Dr. Burkhard Sanner, EGEC, Brussels, and Sandra Kircher, Messe Offenburg. Collecting the award, Anthony Hinde, International Marketing and Sales Director at Exergy said “Exergy is delighted to be the Winner of the European Geothermal Innovation Award 2016, recognising the efforts of the whole team in designing and the implementing the world’s first 2-pressure level ORC cycle on a single turbine. This unique Organic Rankine Cycle turbine has opened up the possibilities for previously uneconomic projects to be commercially viable, by greatly increasing the efficiency possible in small, low enthalpy geothermal power plants. Our first 2-pressure unit has been in operation for almost one year and the performances have surpassed expectations and relevant guarantees. The European Innovation Award, now in its third year, is an initiative of the European Geothermal Energy Council and Messe Offenbourg. The award is given to companies that have made an outstanding contribution towards the field of geothermal energy in the form of innovative products, scientific research or project initiatives.